HYDE PARK, N.Y.—The pan burst into red-hot flames. For a second, I thought, “This is it. 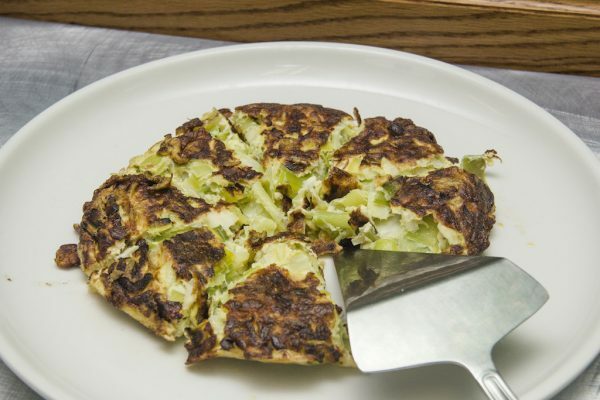 I’ll be known as the clueless journalist who burned down the country’s most prestigious culinary school.” This being my first attempt at making a leek frittata, I had yet to understand, as I slid the mixture of chopped leeks and eggs into the hot olive oil, that the combination of high water content and super-hot oil would spell trouble. The chef-instructor, Dave Bruno, rushed to my aid. He turned down the heat, lifted the pan off the stove, and tossed the leeks a few times in the air. He showed me how to move the pan around so the egg mixture cooked evenly throughout, then quietly moved on to check on the other students. The crisis was averted, but I felt my cheeks were singed with embarrassment. 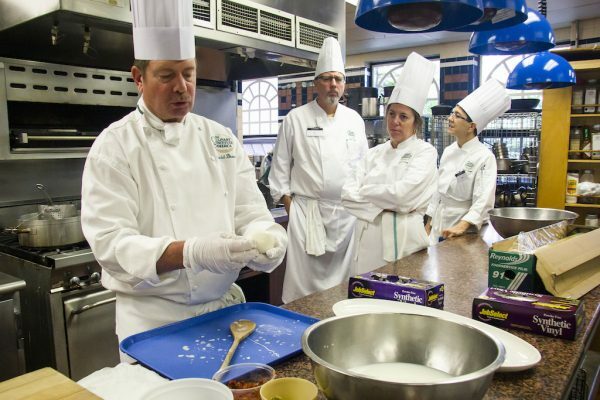 This was my first time learning how to cook, at the Culinary Institute of America (CIA) in Hyde Park, in upstate New York. Despite my love for food, I have little experience making meals. The thing is, my mother is an excellent home cook—and extremely protective of her kitchen. It is her domain, where she is free to experiment with heat and time to transform ordinary ingredients into dishes with satisfying flavors I didn’t even know existed. When I’ve pleaded with her to teach me her Cantonese recipes, she has always dismissed my request, telling me I have to earn my keep, like a medieval apprentice to a master. “You don’t even know how to hold a knife properly,” she says. “Whose fault was that?” I think to myself. She’ll say she will only teach me after I grasp the kitchen basics. Of course, I know she refuses to reveal her culinary secrets because she actually doesn’t want to stop cooking for me. But when I learned that the CIA offered recreational cooking “boot camp” classes, it was my opportunity to prove myself capable. After contacting the school, I found out there were only open spots for the four-day Italian cuisine boot camp class. Although I wouldn’t get the foundational skills of the basic boot camp class, I figured it would still be beneficial to throw myself right into the thick of it and learn to cook one of the most influential cuisines in the world today. My lack of familiarity with knives proved to be a handicap. On the first day, every student had to dice up onions and make tomato concassé: a term meaning peeled, de-seeded, and diced. I soon discovered the tomatoes’ slippery surface would cause the knife to slide so that it would threaten to cut my fingers. I tried to work more carefully, but when I realized that I was behind the rest of the class, I felt more anxious, resulting in more near-misses. Seeing me struggle, a classmate came over and showed me that gripping the handle closer to the blade stabilized the knife and made it easier to control. My fellow classmates all had more experience than I did. Most were avid home cooks, or had taken a boot-camp class before. They had different reasons for taking on the immersive experience in Italian cuisine. One mother-daughter duo was taking classes together so the daughter could prepare home-cooked meals while attending college in Scotland. One Italian-American, whose mother passed away when he was young, yearned to experience again the culinary traditions of his Italian family. A retired gentleman said he wanted to learn to cook as well as his Italian mother had. And there was a mother who wanted to have more dishes in her repertoire. For them, cooking meant more than just putting food on the table. We split up into teams of three or four. Each day, we were in class by 7 a.m. After a short lecture, we would work in the kitchen, preparing a set of dishes by noon. I teamed up with the mother-daughter duo. On day 1, they thought the garlic-roasted potatoes dish was a simple enough recipe that I could try it as a first-timer. The dish wasn’t a disaster, but the potatoes were too chewy on the outside, and inside, they weren’t soft and fluffy the way I wanted. But there wasn’t time to get discouraged. Throwing yourself in the line of fire forces you to learn quickly. After a lecture on culinary traditions in the central regions of Italy, I was assigned to make a classic Italian dish: stuffed artichokes. While cleaning the artichokes, I understood why only a nonna would have the patience and unconditional love to make this. First, I had to trim off the stems and pointy ends of each leaf. After boiling the artichokes in acidulated water to keep them from browning, I snipped and carved out the leaves in the center, to get at the choke underneath. Then, using a spoon, I scooped out all the prickly needles. With an impending deadline, I had to work fast. Those chokes were stubborn; my aggressive scooping resulted in sore wrists for the next few days. But that wouldn’t stop a nonna. And she would never cut corners. 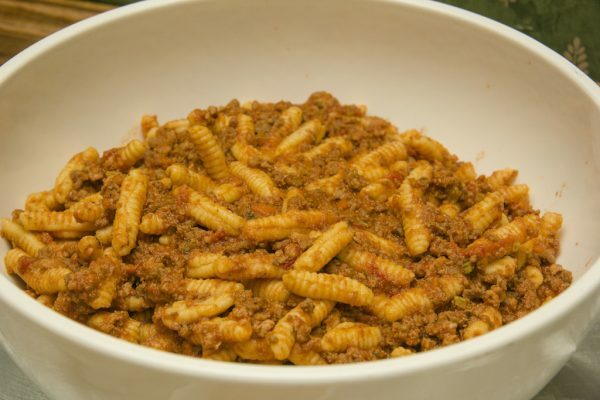 So I painstakingly stuffed in the breadcrumbs mixture, an umami-loaded combination of capers, anchovies, garlic, and parsley, so that it was distributed evenly among the leaves. 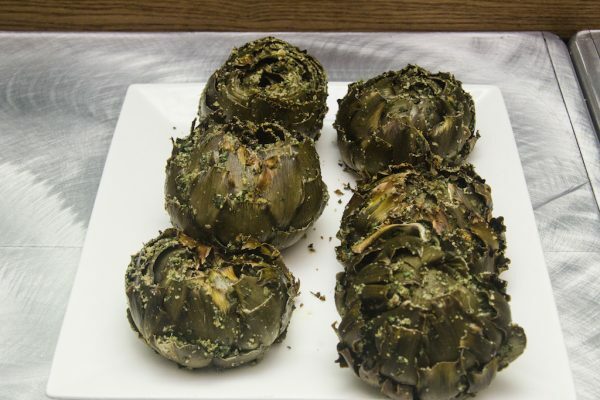 The artichokes are roasted in the oven. When they’re ready, only the tender bits of artichoke at the ends of the leaves are edible. It is a lot of hard work for fleeting moments of satisfaction. 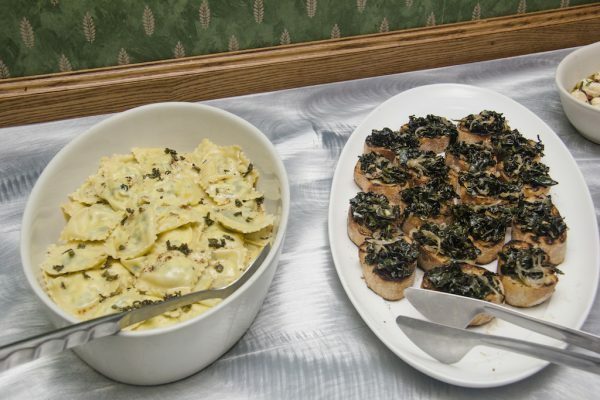 But when our feast was laid out with our dishes, I overheard chef Bruno say, “Isn’t it just like how Grandma made it?”, and my Italian-American classmate agree. I realized this is what my mother must feel when she prepares her holiday feasts and her dishes are enthusiastically devoured by hungry guests. Investing time and energy in making people happy is a singular experience. You don’t seek anything in return, yet the sense of generosity and fulfillment you gain is manifold. 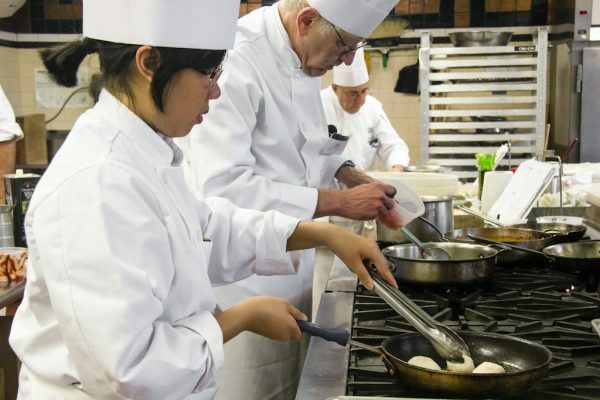 Taking a class at the CIA also means you learn how to work in a professional kitchen. When cooking multiple dishes, time management is key. Mise en place is critical to save time; once you have all the ingredients you need in front of you, the process flows fluidly. Pizza and pasta dough require time to rest. 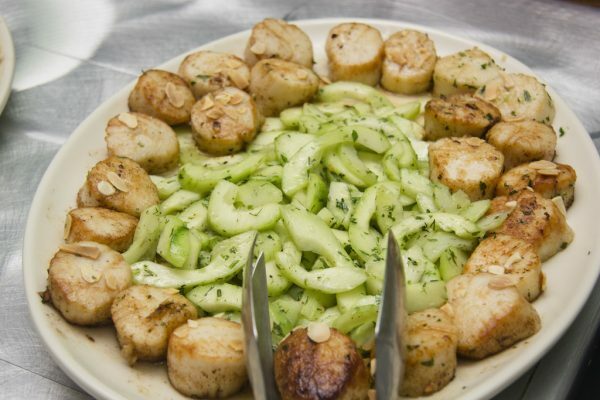 Scallops cook quickly, so make them last. And if you need to dredge them in flour, do it right before you put them in the pan—otherwise, the flour will stick. Chef Bruno taught us many more tricks of the trade: the proper way to take apart a chicken, or even a rabbit (a regular feature of northern Italian cuisine) if you’re game for it; placing pancetta in the freezer so you can easily cut it into pieces; and knowing when pasta dough is at the right level of wetness (when it starts sticking to the mixing bowl). If you’re a kitchen appliance nerd, the chance to use professional equipment is exhilarating. One of my classmates, an aficionado of smokers and barbecue grills, enjoyed using the Josper, a hybrid of an oven and a grill, to fire up a Cornish hen. By day 4, I was pumped to enter the kitchen. Sharp knives and hot pans no longer seemed intimidating, the frittata kerfuffle aside. I even whipped up a big bowl of handmade cavatelli pasta. The class parted ways, promising to keep in touch; should they sign up for another boot-camp class, they could do it together. I returned home, bringing some of the dishes I’d made to my mother. Biting into a scallop, she chewed thoughtfully before giving her verdict. “It’s very good,” she said, smiling. I promised I’d prepare her a whole feast next time. 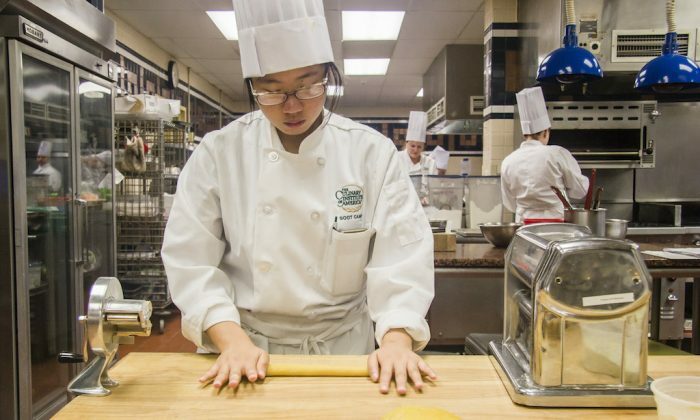 The CIA offers boot-camp classes throughout the year, from basic training to the cuisine-focused, like Mediterranean and Asian. There are also technique-based boot camps focused on baking, grilling, or seafood, for example. You’ll be gifted with chef whites as your uniform, as well as a binder full of recipes. Note that you won’t have to bring any tools or wash any dishes. Classes last anywhere from one to five days. Prices vary by class. Taking simple steps in selecting, storing, and cooking foods can make a big difference in increasing nutrients.